In an exceptional park with trees, quiet and countryside near the beaches! Distinguished house located in an extraordinary green setting: the domain of the Keryvallan Mansion House (small Breton mansion of the XVIth century), in a park planted with trees of 5 hectares, near the Gulf of Morbihan, in the heart of the Pays d'Auray. 6 minutes away from the small harbour of Saint Goustan, 15 minutes away from beaches, from Carnac and its lines of menhirs, from Trinité-sur-Mer, the beaches, the marina, from the Ria d'Etel. 20 min from the dunes of Erdeven, from the Quiberon peninsula and its wild coast, from Vannes (Jazz festival and historic feasts) and 25 minutes from Lorient (Inter Celtic Festival). On the ground floor: large living room (42 m²) with dining area, adjoining kitchen, and recreation area with large fireplace. Living room (27 m²) with bookcase, TV and hi-fi system. Toilets and shower. Upstairs: 4 bedrooms, including 2 with Mezzanine. Bathroom WC. High quality furniture. Carefully decorated. Perfect area for children with lawn, park with trees, meadows and small woods. A few words from the owners: 'Our encounter with the Keryvallan domain was a serious case of love at first sight. What a chance and a pleasure to discover, in 1991, this place steeped in history with its buildings of stone, its small XVIth century Breton mansion, the few ruins of an ancient fort from the XIIIth century, the meadows and the small woods. The harmonious layout of the buildings and the serenity given off by the big picture, which was abandoned and practically in ruins at the time, made us want to begin this long restoration and landscaping work, just completed in 2011, 20 years after. Today, the place is very pleasant and we are happy to be able to cater families and allow them to discover our beautiful region, this south coast of Brittany, so mild and varied, between beaches and rocky coves, with, icing on the cake, the Morbihan Gulf, small enclosed sea with about fifty small islands, rated as some of the prettiest bays in the world! During summer, we are often travelling far from our beautiful Brittany. Therefore, the guests staying in the Keryvallan house are, for the time of their stay, the only residents of this 5 hectares property, in a green area not far from the sea. You are welcome! We are theatre actors often on tour for our shows. We lived during all of our childhood in this beautiful region of Brittany between the sea and the Gulf of Morbihan. We had a serious case of love at first sight in July 1991 when we discovered the Keryvallan domain, with its small XVIth century Breton mansion, the traditional house and the outbuildings, surrounded by trees in the heart of the countryside, near the small town of Auray. The quiet given off by this charming place seduced us. For 20 years, we have been restoring these character buildings and planting trees and plants around this attractive living space. A small auditorium has been set up in an old barn: we are hosting theatre shows and music concerts (jazz, world music...), and artists on creation retreats. During summer, the theatre is closed. The house can be rented in any season; in July and August, you will be the only residents of this domain of 5 hectares, 15 minutes away from beaches. We took great pleasure in living with the family in this charming house for the 12 years necessary to completely restore the Keryvallan small mansion. Today, while we live in the mansion, we are happy to share this setting with you and let you enjoy the quiet of the domain, in the heart of a region rich in discoveries, between pleasures of the beach, strolls on the islands, hikes and local heritage tours. In summer, we are not here. Therefore, Gwen will meet you. She will give you advice to help you enjoy this place to the fullest. Charming house in the heart of a park planted with trees. Quiet and serenity for the idleness. Ideal for a large family. Immediate proximity of all the tourist sites of the area. Carefully decorated. High quality furniture. Garden furniture and barbecue. Games area for children who will also be able to frisk in the meadows and the small woods of the estate. Staying at this lovely escape in Brech, Bretagne is the high-light of my European trip so far. The proprietors, Alain and his wife, could not be more helpful and accommodating, and the house itself is a gem--clean, inviting, and absolutely charming with stunning grounds. I truly felt sad to leave, and hope to return again to this really lovely retreat. I cannot recommend highly enough! Gîte plein de charme, environnement calme, feu de cheminée convivial. Tout à disposition. Que du bonheur de se retrouver en famille dans cette spacieuse maison, dans un magnifique parc où l'on sent la douceur de vivre. 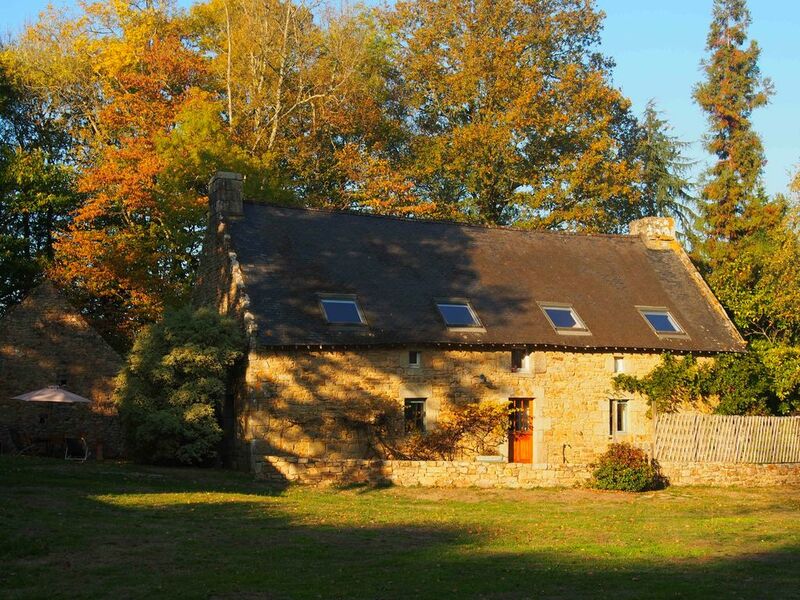 Maison chaleureuse avec sa grande cheminée autour de laquelle nous avons passés un excellent Week end. La maison est très bien équipée et très propre, tout est prévu pour que les vacanciers passent un très bon moment. Propriétaire très accueillant, discret, de bons conseils pour visiter la région. Nous étions 7 personnes, venues du sud de la France en (grosses) motos. La propriété est très agréable aussi bien à l'intérieur qu'à l'extérieur. L'équipement est parfait en quantité et en qualité et le mobilier est à la hauteur des bâtiments. L'accueil est super sympa de la part du propriétaire et de ses filles et la propriété est très bien placée pour se balader tout autour, il y a des petites routes pour aller partout. Un petit plus serait une salle de bains supplémentaire. Le cadre de la maison est exceptionnel avec le charme des belles pierres, son superbe terrain et sa forêt. La proximité avec la demeure d'Alain (propriétaire) ne pose absolument pas de problème, l'espace est bien assez vaste! Enfin, l'accueil d'Alain a été excellent et nous sommes ravis de cette rencontre! Bref. De superbes vacances en famille, que nous rééditerons sans doute! Nos vacances, d'une semaine, à Kerivalan furent très réussies. En l'absence des propriétaires, nous avons beaucoup apprécié l'accueil de la personne chargée de nous accueillir et de votre corbeille "Bienvenue". La maison était pratique et confortable. L'environnement naturel du domaine très agréable avec ses beaux arbres, ses hortensias, ses arbustes en fleurs et ses vastes espaces. Cela donne bien sûr envie de revenir . Close to the sea shore, the Gulf of Morbihan, Carnac and Trinité-sur-Mer, in a quiet countryside setting in the heart of the Pays d'Auray, in the Morbihan, on the south side of Brittany. 5 minutes from the small Saint Goustan mediaeval harbour and from the pretty Bono harbour. 15 minutes from the Gulf of Morbihan. 15 minutes from the beaches of Trinité-sur-Mer, Carnac, Saint Philibert and Locmariaquer. 15 minutes from Vannes (Jazz festival, historical feasts). 15 minutes from the Ria d'Etel. 20 minutes from the Quiberon peninsula and its wild coast. 20 minutes from the dunes and beaches of Erdeven and Etel harbour. 20 minutes from Lorient (Inter Celtic Festival). 20 minutes from Haliguen harbour in Quiberon where you can embark on a boat to the islands of the south coast of Brittany: Belle-Ile, Groix, Houat, Hoëdic (one-day trip possible). 30 minutes from the Rhuys peninsula, Sarzeau, Suscinio Castle, harbour of Couesty. Saint Degan eco-museum nearby by footpaths. The Saint Lauren and Baden golf courses are 10 minutes away. The house is located within the Keryvallan estate which is an extraordinary site with several character buildings including a small XVIth century mansion house and the ruins of an ancient fortification from the XIIIth century. During the summer season the guests staying in the house are the only residents of this estate of 5 hectares with a park planted with trees, meadows and small woods. All shops, services, restaurants and cinema are 5 minutes away by car (in Auray, corner shops in the town centre, hypermarkets in the commercial areas, restaurants, bars downtown or on the Saint Goustan harbour, cinema with 3 rooms downtown). Nautical activities: swimming, sailing, surf, scuba diving... Les Petits Délires theme park is 10 minutes away. Tennis court and horseback-riding facilities 10 minutes away.